Yeppers, pretty much the samsies as yesterday. True wind on our nose at a whopping speed of 2-3 knots, making sailing impossible for us. The upside of such conditions is that the ocean has become glass. We enjoyed multiple visits from our dolphin friends. The pilot whales dropped by for an afternoon of bridge. 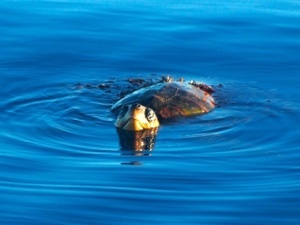 And finally, this cutie pie sea turtle (one among many) was gorging himself on a unending buffet of jellyfish. This one in particular, I think, was probably female based on the lovely skirt of algae. It really showed off her svelte shell shape nicely. In addition to calm seas providing smooth waters, it also offers opportunities to really get things going in the galley. Today was no exception. We ate big. Breakfast of scratch-made whole wheat oatmeal corncakes, cheesy egg scramble, and way too much coffee. Lunch came too quickly for me, but the kids won’t stop eating. Cheddar-jack whole wheat quesadillas, SheShe Melon (this would be honeydew melon tossed in fresh key lime juice, and refried beans. We came to the sudden and horrific realization that we are nearing the bottom of our last bottle of Colorado Chili Cowboy Ghost Pepper Hot Sauce. (Chief – if you’re reading this, please wrangle up a posse of carrier pigeons to arrange an air drop of your next batch – we are desperate out here.) Finally dinner, since all the daytime napping had really worked up my appetite. Grilled garlic glazed lamb chops, served with buttermilk whipped gold taters & gravy (of course), and obviously no meal underway is complete without a can of La Suer pea balls. We are expecting the wind to turn on any minute – at least that’s what Ahab keeps telling me. Hopefully sails will up by the end of my shift. Our fallback position if the weather does not start cooperating, is to toss the boys overboard with their fins on and start kicking for Horta. Ali, you really need to write a book after this adventure — including these LOL posts! Sorry, saw this post after I commented on the last one. Beautiful picture of the turtle! Maybe you should eat more refried beans, all that gas might help the boat move faster! When all else fails, eat something good!!!! Glad to hear you are doing well. Calm seas are better than rough, for sure. What fun for all of you to have great food and wonderful creatures to share your journey. Hugs Dottie Betz P.S. WE are back in Maine. The ocean is always bluer on the other side……Doing next to nothing while gazing at sea life with calm seas sounds fantastic! Remind yourself of the “end of year awards, concerts, banquets, teacher gifts, parties, photos, etc.” chaos that ensues in the good old U.S. of A. school culture and you’ll be glad you’re floating undisturbed. My life is so choppy, full of white caps, and six-footers that I don’t know if I’m in a power boat or a hurricane somedays. (I’m trying to write as well as you…..) Lastly, if the winds don’t pick up, feed those boys more beans and then throw them in the water with their fins! Good going! You escaped many pitfalls that trap so many in the Virgin Islands! Keep on going! True gourmet eating on your journey .. do you have an ETA and are you impressed that I even know that??????? WOW, BIG doins today .. I think I finally got the CAPTCHA code right on!